With integrated support for multiple connection methods, including HDMI to suit a wide range of entertainment devices, the EH-TW650 makes home entertainment more accessible than ever. Enjoy this convenient solution for smooth and smart projection. With the iProjection app, you can project images directly from Android and Apple iOS tablets and smartphones. 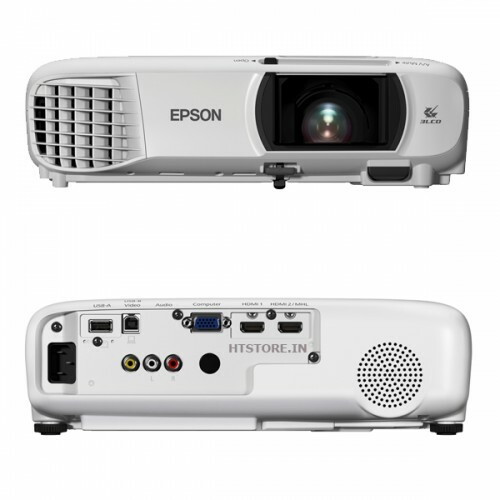 Install iProjection for PC application to have wireless projection from PC or laptop. With iProjection, the QR code displayed by the projector can be read by a smart phone to transmit the device information so they can be connected easily. Heighten your gaming experience by bringing more clarity to dark scenes and enjoy your game the way it was made with detail enhancement. This mode improves the response speed for images* projected at high-speed. Easily correct and eliminate distorted images with the intuitive one-touch horizontal keystone adjuster. Vertical distortion is detected by the projector itself and is corrected automatically. With a combination of adjustment features to correct image distortion, you’ll be able to enjoy a broader range of placement options. With the zoom lens and keystone adjustment features, you’ll have a broader range of placement possibilities. Fewer placement limitations mean it’ll be easier for you to relax while enjoying your favourite entertainment on the big screen. Simply save pictures and movies* on a USB memory device, insert into the projector and your pictures/movies are projected automatically. The viewer can see beautiful pictures/movies as they are for a more dramatic impression. Watch your images and videos in your smart devices appear larger-than- life with the MHL port. Simply connect your MHL-compatible device with the MHL cable to fully enjoy your contents on the big screen. What’s more, when connected, you can charge your Android smart device and operate it using the projector’s remote control. MRP of replacement lamp for this product is Rs. 4899/-.